Few people today visit Utah beach. 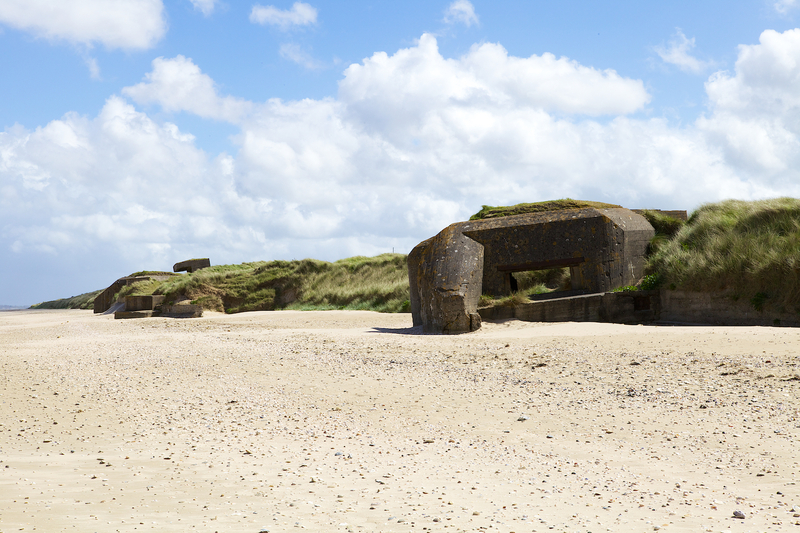 The sand seems colder and flatter than anywhere else along the Normandy coast where the Allies landed on D-day. The town of Arromanches – a few miles to the east and closer to Omaha, Gold and Sword beaches – is a crowded theme park of war museums, cemeteries and souvenir shops, bunkers and bunting. Guidebooks in hand, tourists edge gingerly around the German gun emplacements and try to imagine what it was like to stare down the gun sights at the vast armada approaching the shore. But Utah beach, on the western edge of the landing grounds, is silent. A few waves swill over the sand as if too bored to think of anything else. The coastal land seems lower than the sea, and fails to echo the sounds of war inside one’s head. Walking along the beach some years ago, I noticed a dark structure emerging from the mist ahead of me. Three storeys high, and larger than a parish church, it was one of the huge blockhouses that formed Hitler’s Atlantic wall, the chain of fortifications that ran from the French coast all the way to Denmark and Norway. This blockhouse, as indifferent to time as the pyramids, was a mass of black concrete once poured by the slave labourers of the Todt Organisation, pockmarked by the shellfire of the attacking allied warships. A flight of steps at its rear led me into the dank interior with its gun platforms and sinister letter box view of the sea. Generations of tramps had dossed here, and in the stairwells were the remains of small fires, piles of ancient excrement and a vague stench of urine. At first sight, the blockhouse reminded me of the German forts at Tsingtao, the beach resort in north China that my family visited in the 1930s. Tsingtao had been a German naval base during the first world war, and I was taken on a tourist trip to the forts, a vast complex of tunnels and gun emplacements built into the cliffs. The cathedral-like vaults with their hydraulic platforms resembled Piranesi’s prisons, endless concrete galleries leading to vertical shafts and even further galleries. The Chinese guides took special pleasure in pointing out the bloody handprints of the German gunners driven mad by the British naval bombardment.